FACT CHECK: Donald Trump's Father Arrested at KKK Rally? Donald Trump’s Father Arrested at KKK Rally? 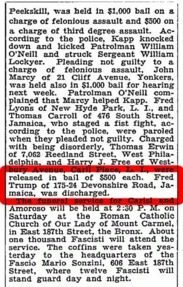 A 1927 New York Times article about KKK arrests mentioned Donald Trump's father Fred, but the reporting was vague and inconclusive. Donald Trump's father was arrested following a Ku Klux Klan-related altercation in 1927. 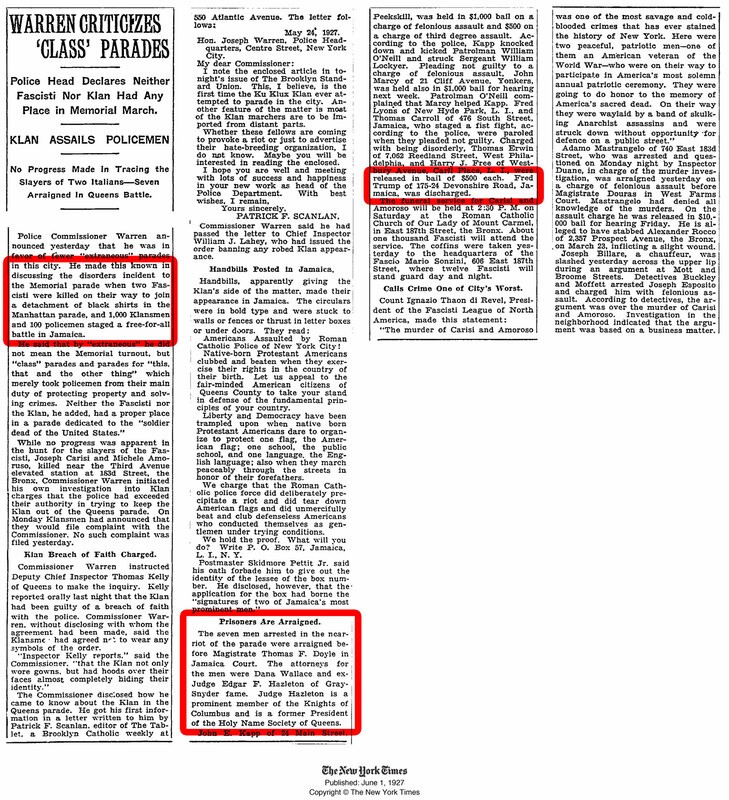 A 1927 New York Times article named Fred Trump among the individuals arrested after a "near-riot" involving the KKK and New York City policemen at a "Memorial parade." The article did not document that Fred Trump was a KKK member or supporter, or that he was charged with a crime in connection with the KKK event. In 1927, Donald Trump’s father would have been 21 years old, and not yet a well-known figure. Multiple sources report his residence at the time — and throughout his life — at the same address. To be clear, this is not proof that Trump senior — who would later go on to become a millionaire real estate developer — was a member of the Ku Klux Klan or even in attendance at the event. Despite sharing lawyers with the other men, it’s conceivable that he may have been an innocent bystander, falsely named, or otherwise the victim of mistaken identity during or following a chaotic event. A person answering calls at the N.Y.C. Police Department’s Records Section said that arrest reports dating that far back were not available in any form. As BoingBoing stated, the information available in the article made it difficult to figure out whether Trump’s father was directly involved in the melee or was simply a bystander who coincidentally found himself in the wrong place at the wrong time. Other persons were charged with various infractions ranging from felonious assault to disorderly behavior, but Trump wasn’t mentioned as having been cited for even minor criminal charges. According to BoingBoing, New York City no longer holds any information about arrests dating as far back as 1927, making it impossible to independently verify the original Times report. Mr. Trump’s barrage of answers — his sudden denial of a fact he had moments before confirmed; his repeatedly noting that no charges were filed against his father in connection with the incident he had just repeatedly denied; and his denigration of the news organization that brought the incident to light as a “little website” — shows his pasta-against-the-wall approach to beating down inconvenient story lines. Q. Have you seen this story about police arresting a Fred Trump who lived at that Devonshire address in 1927 after a Ku Klux Klan rally turned violent? A. Totally false. We lived on Wareham. The Devonshire — I know there is a road Devonshire but I don’t think my father ever lived on Devonshire. Q. The Census shows that he lived there with your mother there. But regardless, you never heard about that story? A. It never happened. And by the way, I saw that it was one little website that said it. It never happened. And they said there were no charges, no nothing. It’s unfair to mention it, to be honest, because there were no charges. They said there were charges against other people, but there were absolutely no charges, totally false … Somebody showed me that website — it was a little website and somebody did that. By the way, did you notice that there were no charges? Well, if there are no charges that means it shouldn’t be mentioned … Because my father, there were no charges against him, I don’t know about the other people involved. But there were zero charges against him. So assuming it was him — I don’t even think it was him, I never even heard about it. So it’s really not fair to mention. It never happened. And by the way, my father was not involved, was never charged and I never even heard this before. What? It comes out on a website and you are going to write it on The New York Times? It shouldn’t be written because it never happened, No. 1. And No. 2, there was nobody charged. While it’s possible the elder Trump attended the event along with KKK supporters and Klansmen, it’s also possible he was minding his own business in his own neighborhood and got swept up by police after unknowingly finding himself in the middle of an enormous brawl.